The trial of the man who has admitted killing 77 people in two separate attacks in Norway last year will hear a verdict from the judges this morning. THE VERDICT IN the trial of the man who has admitted killing 77 people and wounding more than 240 in bomb and gun attacks in Norway last year will be delivered this morning. A court in Oslo will deliver its verdict in the trial of Anders Behring Breivik at 9am Irish time (10am local time). Breivik has already admitted to executing a bomb attack which killed eight people and wounded 209 in central Oslo in July 2011 before he shot dead 69 people on Utoya island, 34 of whom were aged between 14 and 17. A panel of five trial judges must rule on Breivik’s sanity when they deliver their verdict effectively determining whether or not he is insane. 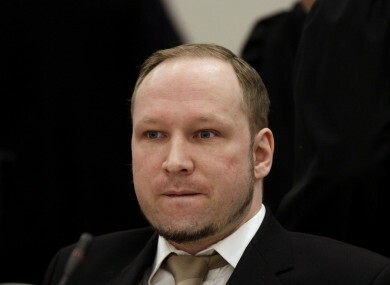 Breivik has said he will appeal any ruling which finds him insane. Two separate psychiatric assessments of the 33-year-old have reached different conclusions on his sanity and the judges’ conclusion will determine whether he is given a long prison sentence or sent to a secure psychiatric ward. Breivik’s 10-week trial earlier this year heard harrowing testimony from witnesses and victims of his attack on a Labour Youth Camp on the island of Utoya where people were shot dead at close range. Email “Verdict in Breivik trial due at 9am this morning ”. Feedback on “Verdict in Breivik trial due at 9am this morning ”.